My desk has been in a state of distress for the last couple of months. The holidays, getting my daughters settled at the university, end of the gardening season, and a family who likes to deposit all of their things on my desk, are my excuse. No more. I need an organized area to work, once again. One of my recent resolutions is to keep on top of family special events. No one wants to be known as the auntie who's always late with birthday cards. Organizing my supplies will hopefully help in that area. 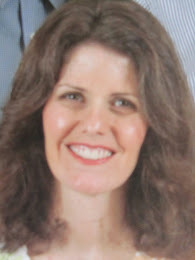 Plus, I'll save a bit of money, as I won't be heading off to the store to buy birthday cards, when I have several to choose from, right here at home. Maybe you have these, too. Squashed boxes of envelopes in a drawer. 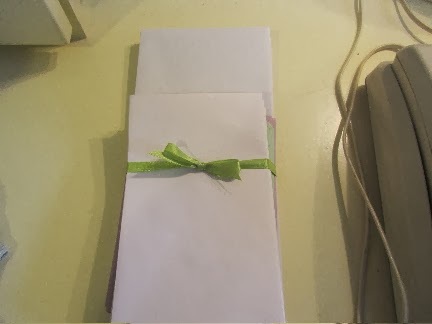 I piled several sizes of envelopes together, and tied with a pretty ribbon. The ribbon wasn't totally necessary, but it says to me that I care what my desk looks like. 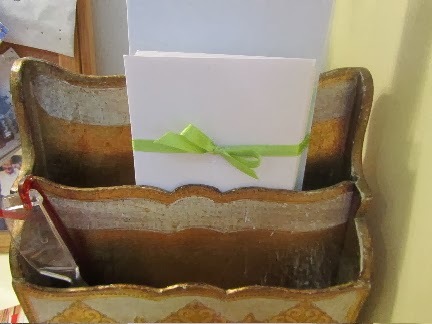 My letter caddy had become a general receptacle for any paper to cross my desk. 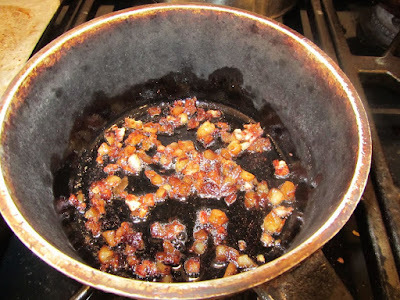 I emptied it. Then placed the bundle of envelopes in one of the front sections, along with postage stamps, and envelope-sealing stickers. 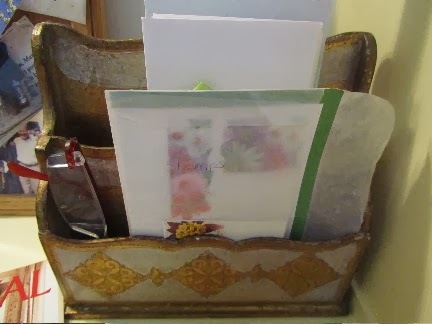 The backside of the caddy now holds an assortment of greeting cards, homemade and shop-bought, from wedding, to new baby, to get well, and to birthday greetings. Now there is no excuse for me to miss acknowledging a special occasion. I also placed a stack of thank you note cards, as I don't want to be the daughter, sister or friend who forgets to express gratitude. Are you one of those very organized gals who always has a card ready for the occasion, and is never remiss with a thank you? If so, what is your secret? I've been working on this for the better part of my life, and have only made baby steps of progress! I finally gave up last year on sending birthday cards to my adult nieces and nephews as half the time I was forgetting, anyway, so I'm probably not the best one for giving advice! 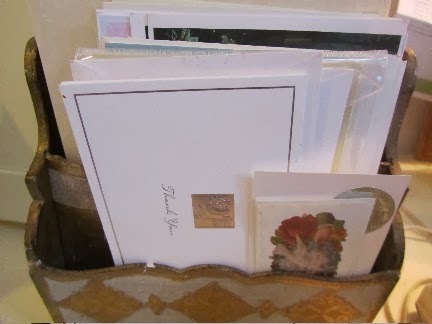 I do as you do--I keep a stash of cards for different occasions on hand so I can quickly send off a card. I especially like to have bereavement cards on hand as that's something I really don't want to neglect to do (but it would be too easy for me to forget if I have to make a special trip to purchase a card). 2014 is the year I hope to de-clutter our desk and my bedroom. I've been saying that for a few years, though. Yes, condolence cards are a must. I think I have a couple in there -- I'll have to check. Thanks for the reminder. Good luck getting your areas organized. It seems to be something I have to do over and over. Last year, I went through all of our cards and stationery and organized it all. Now it's fairly easy to find a card or paper for the occasion I want. However, I will say that the most important part of this organization was getting rid of a good deal of what we had. I knew that were some cards or stationery that I would never use. I boxed it carefully and gave it to Goodwill. I know that someone will be able to use it. 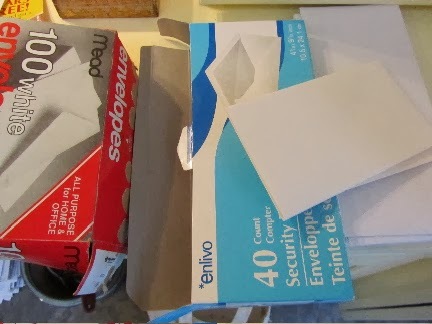 In the meantime, I don't get frustrated every time I look through the paper supplies to find a card or envelope. Good for you! And passing on what you know you won't use makes it easier for you, and it gives someone else an opportunity to use what you won't. Good job! I cleaned out the desk drawer that holds cards and assorted stuff, too. Got rid of a bunch of stuff, but I really need to sort through the cards ...have some I know we'll never use,and it creates a false sense of security. "Of course I have a card for xxxx ... why, there's a whole stack of them" Not. I think going through the cards every so often is a good idea. As you said, you may think you have an appropriate card, but really don't. Good work going through your cards! That's a nice site. E-cards are definitely a good alternative for many occasions. Many on my "regular" card list do check email (although not everyone), and for a lot of situations an e-card is a nice "thinking of you" message.